"You ever been robbed for water before?" asks Tity Boi. "That'd be pretty fucked up." We’ve watched Tity Boi try the world’s most expensive burger (it’s $295), and we’ve seen him and Big Sean discuss the taste of a $100,000 diamond-infused martini. 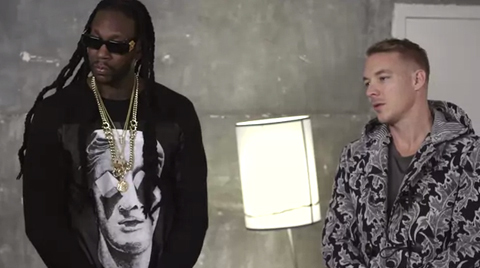 Now, 2 Chainz teams up with Diplo to try Beverly Hills 9OH2O’s $100,000 Diamond Collection bottle of water. Spoiler alert: Tity Boi is not impressed. “Why would you drink expensive water, when you could just drink rain?” he asks. “It almost seems like if you put a diamond on something, they gonna run up a tab on you.” TRUUU. “I’m going to stay down with my motherfuckin’ Aquafina, my Fijis, my Smartwaters—you know where I’m going with this.” FOH, water sommeliers.